By the fifteenth century, the association of Blackness with cosmopolitanism and Christian universalism that had been cultivated since the Hohenstaufen seems to have been fraying in the face of threats posed by Mongol expansion from the east and Ottoman expansion from the southeast. Authors and illustrators, as in this manuscript about the Antichrist, were beginning to use images of Blackness to denote evil and danger. In this narrative, the Antichrist successfully converts the kings of Libya and Ethiopia, and they join many other worldly kings in flocking to his banner. 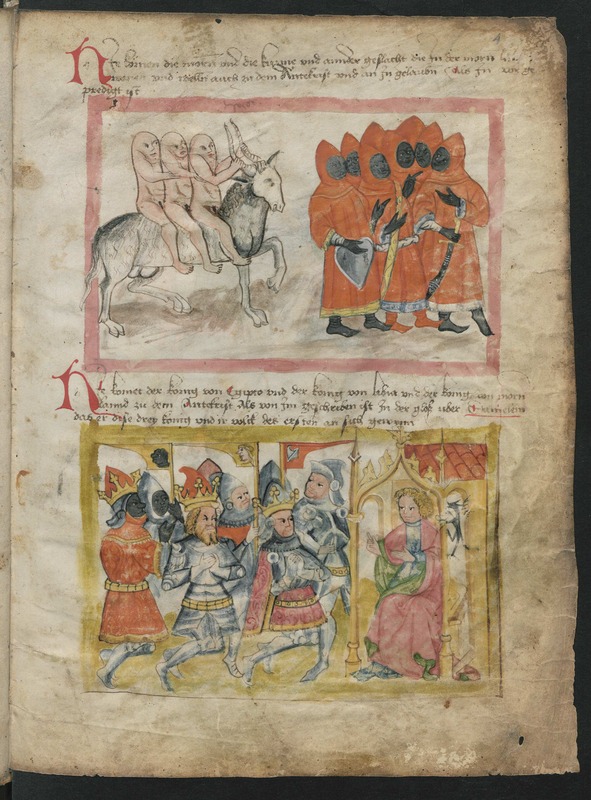 The top image reproduced below shows fantastical Blemmyae (monsters with heads in their chests) marching along with the Ethiopians to meet the Antichrist, and the bottom image turns the story of the Three Magi on its head, as three kings pay homage to the Antichrist. Source: Vom Antichrist (Bavaria, ca. 1440-1450), Staatsbibliothek zu Berlin Preußischer Kulturbesitz, Ms.germ.fol.733.4r. The King of the Moors submits to the Antichrist (ca. 1440-1450) by Jeff Bowersox is licensed under a Creative Commons Attribution-ShareAlike 4.0 International License.